Bring water and ginger to boil in saucepan; cover. Simmer on low heat 20 min. Strain into 1-L heatproof pitcher; discard strained ginger. Add drink mix; stir until dissolved. Add lemon slices. Add 2 cinnamon sticks to the simmering ginger water for the last 15 min. Strain, then continue as directed. Prepare as directed; cool. Refrigerate until ready to serve in ice-filled glasses. 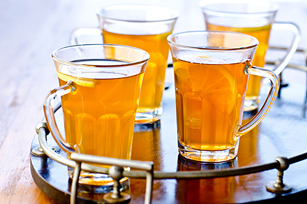 This soothing hot beverage can be part of a healthy eating plan.